Many today church shop, for the church that is the most engaging, that has the best preacher, the best music, or the best morning coffee? It’s funny to think that even on a deserted island a man might switch churches. But it’s endemic of our culture. We go most places to be served, to receive care and service. And sometimes we bring that attitude of entitlement, and I want what I want to church, instead of thinking of church as a place where I serve. Church membership… what does that bring to mind for you? I think of a dusty church building, with an old binder, that hasn’t been looked at in years, full of a list of names who no longer go to the church. Church membership, as a knee jerk reaction makes me think of something passe’, something I don’t care about, something institutional, denominational, something that is part of a bygone era. And if I’m seeing “church membership” in this way, then I’m not seeing it correctly. Let me tell you who you really are: you are part of a holy insurgency, a great Jesus movement that began 2,000 years ago at the resurrection of Christ. And we as that body of Christ, this army on Earth, have been fighting, tooth and nail, day and night, to pull souls from the depths of hell and darkness, ever since Christ left us with His Holy Spirit and returned to heaven. You are part of a legacy of victory over death that spans human history. You are a holy resistance movement against the kingdoms of darkness of this world. You’re currently under orders from Christ our commander, to commit subversive acts of love and holiness that shock people out of their apathy, toward realization of ultimate reality. You are bursts of light and color in a shadowed world of bland grays, cubicles, contracts, bills, and dull monotonous consumerism. You bring a clear, meaningful message to a confused world: God does exist. Sin is a disease on humanity. And Jesus Christ is the cure. Heaven is real, hell is real. And everything hangs in the balance, today. Be a disturbance to your friends, neighbors, and people you see at gas stations, department stores, and grocery markets. 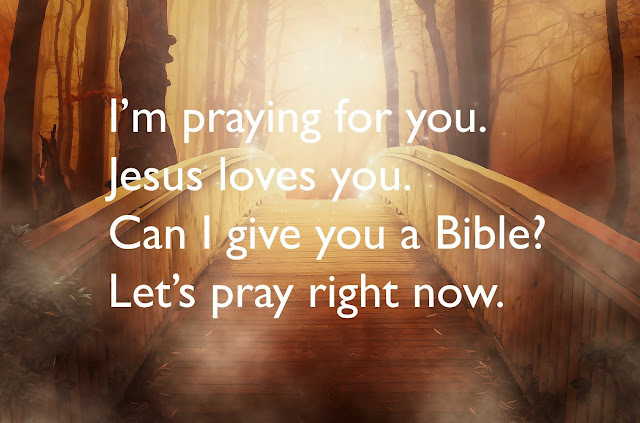 Disturb their misery with just a few words: I’m praying for you. Jesus loves you. Can I give you a Bible? Or even, “Let’s pray right now.” Make the other people in line wait a little longer. You’ve been chosen by God for this task. You’ve been chosen by the creator of space, time, the universe, and humanity to be part of his own personal family. This is a great gift. But also a great responsibility: People out there are counting on you to fulfill the calling God has placed on you. And we’re all called to serve. Each of us… chosen by God. That’s crazy to me. Because I never get chosen for anything. I’ve never won a prize drawing in my life. I was never cool in high school; I’m still not cool today. But I’m chosen by God. He chooses outcasts, the most unlikely people. And let me add this: He has chosen you for just such a time as this. Christianity was once the predominant view of what life really is on this Earth. But we’ve seen in the past 100 years, a decline in the influence of Christianity in public life. Today, sometimes we treat it as if it’s a nice thing, a nice social activity that isn’t really true though. Or maybe we believe in God but practically we live like an atheist. To me, there’s far too much at stake to live as if there is no God. Once I got saved, I saw what was happening to my own generation. So many young people are estranged from the church, lost in sin, cut off from the God that loves them. I get on the L train, and I sit down, and I watch people. I’m an introvert I like to watch people, what they do. And my heart aches as I look at their faces. They need Jesus. And if only someone just a little braver than me was there to speak up and say something, do something. But it’s just me. But sometimes, every once in a while, I do say something. Hope. Honestly, “you don’t know what you don’t know.” I’ve lived that. You go to school, work the job, play videogames, drink on weekends, watch football, go to concerts, go to the dentist, visit grandma, and… they just don’t know about Jesus. There is a massive stream of people, millions and millions out there who are oblivious to the reality of Christ. Jesus is coming back, and he is making all things new. So there is a great urgency to our church mission. And you and I are chosen by God, to be part of the body of Christ, what we call, the church. We are church members. So, I will cherish church membership as a gift. It is a gift. It’s a sacred gift, better than any gift I’ve ever received in my life, or will receive. Better than millions of dollars, better than the perfect house and the white picket fence, better than true love, marriage and children, better than retirement, better than anything, is my love relationship with the eternal God. That said, I have to ask the question: Is something out of order in your life? My membership in the body of Christ is ultimate, #1. Do we treat it like that? Or do we show up once a month, or less? Do we treat our faith relationship with God as some sort of caboose, an end attachment that doesn’t really matter? Are you cherishing something above God? Anything above God is an idol. And anything we put above God we will lose. Do you love your wife or husband or children more than God? Do you love your car, your house, and your big bank account more than God? Here’s a good one, do you love your own selfish pleasures and desires more than God? We have so much in our society: All the science, all the technology, the free market system, the internet, insurance policies, and every luxury… it’s a house of cards. The only reason we have any of these blessings is because God gave us those things. The entire world is held together by the one God-man, Jesus. The Jesus who went to the cross. So I want to transition to Jesus. Because everything in the Bible, in the world, and in our lives as church members is ultimately about Jesus. And if you’ve never heard the gospel, or maybe you’ve forgotten it, the gospel is this: Jesus Christ, lived perfection, as God with us, on a secret mission, to free us from the shackles of sin. Jesus was nailed to a cross, and slaughtered as a substitution for you and me. They call this the great exchange. Every sin I committed, every time I lied, stole something, hurt someone, got drunk, used a girl, manipulated someone.. all of that was put upon Jesus, on the cross. Jesus said, put your sins on me, I’ll take the punishment you deserve. And in exchange, Christ gives us his righteousness, his life, is put inside us… and we are reborn. And just as Jesus Christ came to life, after 3 days of death, so we also, though we die one day, we will be raised just as Christ himself was raised. Through the long sleepless night of his suffering, and the long morning of his death, Jesus carried our death and sorrow, and pain, away from us, and onto himself. Several of those words stand out to me. We are not defined by the world. We are consecrated “set apart” separate from the world. We are made holy by his word. And we have a mission, in which to live differently. Defined By God, not the world. Consecrated, how, by the word, biblical truth. Holy, set apart from the world for… Mission, our mission in the world, as the church, to move people toward Christ. I like how the Message translates Jesus’ words as my people are “truth-consecrated” in their mission. Which is why we consider so carefully the reality of church membership, as an expression of ultimate reality. To be “truth-consecrated” I think means for us, to see our eternal future and to see the infinite value of what we do for God. Because of this consecration the glory of Christ reflects off us, and is a stark evidence to the gray world out there, that there is a God over creation. Thus the lost are invited to partake through the Father, Son, and Holy Spirit, into a unified fellowship, as we ascend on the road to heaven. God’s future kingdom is coming; indeed, it is coming very soon. 1. Live missionally on a personal level – Be a self-driven evangelist, on an individual level. Just you and God, taking action throughout the week: Pray for your friends. Talk to your friends about Jesus. Invite your neighbors to become part of the church family. Post about Jesus on social media. Hand out Bibles at a homeless shelter. Go for a weekly prayer walk. Make a personal plan. 2. Serve on a church level – Serve in this corps. Help out with one of the programs. Get to know someone here that is different than you are. Start an evangelism group, and go door to door around this neighborhood. Tithe regularly, tithing isn’t a suggestion, it’s a command of God. 3. Become an adherent or a soldier- Is God calling you to step up and become a soldier of the Salvation Army? If you aren’t ready to be a full on soldier, you could become an adherent. And maybe, just maybe, God is calling you to become an officer. If God is tapping you on the shoulder right now, start praying about it. In conclusion, our church membership is a gift from God. So please do cherish it as a gift. Because it’s not a binder in a church basement, it’s your life, your future, and your only check against the ways of the world, that are ever present, trying to dissuade you from following Jesus. Thankfully we are not alone. Jesus guides us along this journey, walking beside us every day. And as such, you are a subversive, set apart, revolutionary movement to spread Jesus to lost humanity. We’re traveling home together, to our ultimate home in the new city of God, a perfect, timeless reality. And it’s not simply a nice idea, but a concrete, real future. How Do I Practically Follow God's Will?